The Identity Collection uses colors, patterns, along with UPC Bar Code as a commentary about how we create an identity in our consumer society by what we buy and why we buy it. This series of Identity Beads symbolizes our personal search for identity in our material culture utilizing bar codes and brand name material from post-consumer tin cans. 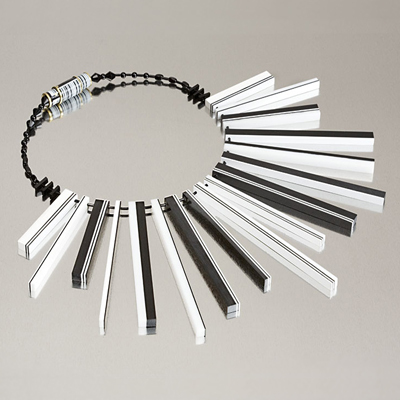 An ongoing series of necklaces about identity in our consumer society using thin lines of black and white plastic to look like a UPC code around your neck. 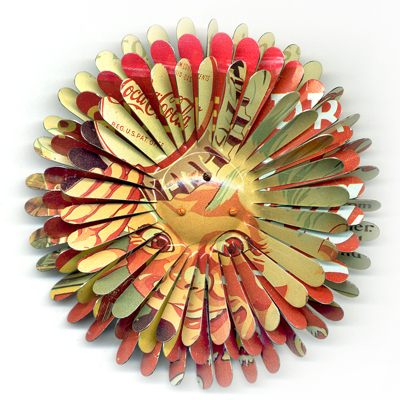 Each one-of-a-kind Flower Pin Brooch is fabricated from post consumer recycled materials. The size and colors of each Flower Pin varies from petite to dramatic. The California Collection is a series of three-dimensional fruit crate labels and art jewelry bracelets with social and political commentary. The primary material is recycled tin cans. In this series the jewelry and display as an integral part of the work. Click on the image or text to see The Fulsome Game, Art Jewelry Bracelets with Gilt Frame or the Paint Box with Pins. RECYCLE is a new series of jewelry constructed from post-consumer recycled plastic containers such as milk, orange juice, shampoo bottles, take out trays, plastic packaging inserts, and other trash items that would normally be discarded.